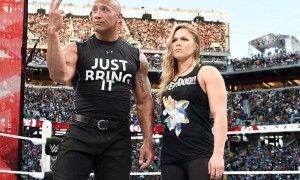 The Rock may not be the only celebrity wrestling at WrestleMania 28. 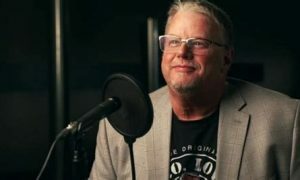 A new report indicates that plans are in motion to follow up an angle from over a year ago that would bring one of the most recognizable names into the ring at WrestleMania. Former NBA superstar, rapper, actor, and Deputy Shaquille O’Neal revealed in a radio interview this week that he is in negotiations to make his pro wrestling debut in Miami. Shaq told the Abe Kanan show that he is negotiating with the WWE to go one on one with The Big Show, following up an angle June 2009 on RAW. This would be absolutely huge for the WWE. The interest in the match is not a big surprise. 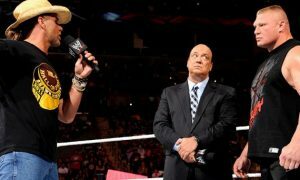 There were rumors following the June 2009 confrontation that the WWE were working hard at booking a SummerSlam match between the two. Unfortunately it was too close to the NBA season to make it happen. Even last June when Shaq retired, the WWE teased the match through Twitter. It should be noted that Bryan Alvarez of F4Wonline.com reported on the website’s podcast that the WWE is not happy that this got out. I note that because there is a possibility that the company changes its mind if this whole angle was scheduled to revolve around a surprise. I am real excited about this one. Of all Guest Hosts, it appeared that Shaq got it. He seemed like a natural when he stepped into the ring. 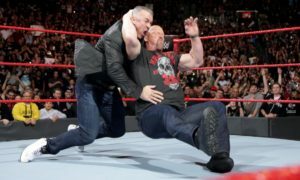 The confrontation he had with The Big Show is still remembered as one of the highlights if not the most favorable moment of the often forgettable run of WWE Guest Hosts in 2009. This would mark The Big Show’s third WrestleMania match against a sports celebrity. Show wrestled boxing great Floyd Mayweather, Jr. at WrestleMania 24 in a match that was a lot better than most people expected it to be. Mayweather went over in the match so Show doing the favor for Shaq shouldn’t be a big problem at all. Show’s other WrestleMania effort against Akebono at WrestleMania 21 did not go nearly as well as the Mayweather match. I think the way to go here is a tag team match. Shaq is a big pro wrestling fan and I can’t imagine it would take him long to adapt. But pulling a singles match on such a big stage in his very first match may be a lot to ask. At the same time, Floyd Mayweather was fantastic in his debut. I think the way to go here is tag team match at WrestleMania and singles match at SummerSlam. This would also mean that another heel turn would be in the works for The Big Show. There is no way that the WWE could expect Show to be cheered over Shaq if this match takes place. Remember, Show was a heel and teaming with Chris Jericho at the time of the last confrontation. Maybe Show turns heel on Daniel Bryan, Shaq comes to the rescue, and we see a Bryan and Shaq vs. Show and Christian match at WrestleMania 28? Whatever the match is, if Shaq is wrestling, this one is going to be huge…no pun intended.